Dunlap is a small village in Peoria County, Illinois and those who choose Dunlap homes for sale are located within the Peoria metropolitan area, which provides a wealth of opportunity. This village is home to many families and retirees, who prefer the atmosphere provided by living in a small community, but remaining near all the amenities needed. The majority of homes in Dunlap are single-family homes. Dunlap real estate includes some rural areas although the growth of Peoria is extending toward this community. Located on Illinois 91, Dunlap has only a few businesses within its 16 blocks. Named after its founder Alva Dunlap, this village has a fascinating history. Dunlap made frequent trips in covered wagons to what is now the present day Peoria area before the age of 30. Thanks to his tireless work and skill, not only did he build a house for his ever-growing family, he also surveyed the land and gave cartography for the area. 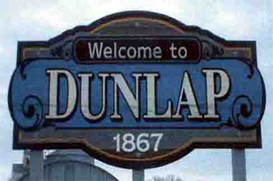 Residents of Dunlap real estate are served by the Dunlap Community Unit School District 323. The district contains 4 elementary schools, 2 middle schools and one high school, Dunlap High. The high school is located on the southeastern edge of the town and is attended by many students from northern Peoria. Dunlap residents have many entertainment options available due to the proximity to Peoria. The Peoria Symphony Orchestra is one. This orchestra is the 10th oldest in the U.S. In addition, the Peoria Ballet as well as the Central Illinois Youth Symphony and several professional and community theaters are located in and around Peoria. The Peoria Zoo is another recreational option for residents. The zoo, which has been expanded, has a major African safari exhibit. The Peoria Playhouse is an interactive children’s museum that was a project planned in combination with the expansion of the zoo. Residents of Dunlap real estate as well as many other cities and towns within Peoria County enjoy the annual Heart of Illinois Fair. The fair has been in existence since 1949 and features a variety of entertainment including concerts, concessions, rides, livestock competitions and motor contests. Residents commute to work in Peoria as well as other areas of the county. One of the major contributors to the economy in Peoria is the health-care industry. Major routes located near Dunlap include Interstates 74, 155 and 474 as well as U.S. Routes 24, 150 and 91. The highways provide residents with a number of options for travel within the county and other areas of the state.